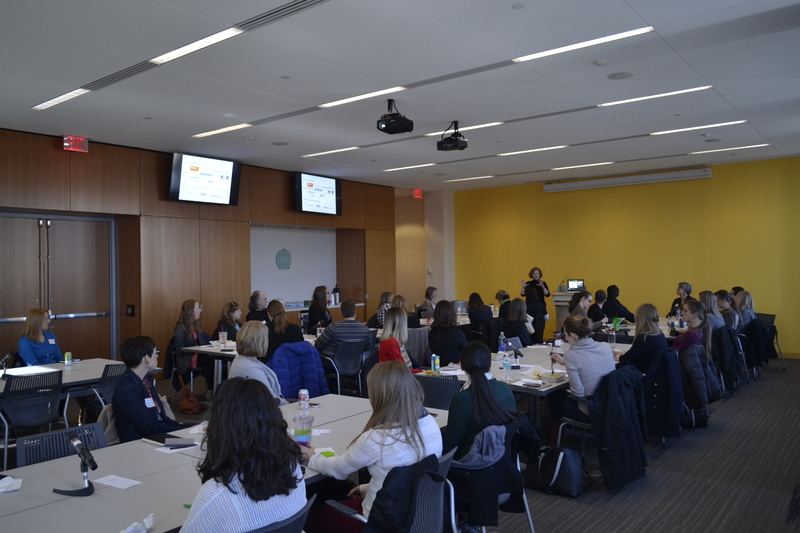 On Friday, January 29, approximately 50 Iowa Women in Architecture members and guests gathered at the DART Central Station to listen and engage with Karla Fultz McHenry, of Fultz McHenry Consulting LLC, about Evolving Leadership in the 21st Century. Karla introduced herself as a lifelong advocate for the success of women and girls in the State of Iowa. She has served as a Legislative Liaison for the Iowa Department of Human Services; the Vice President of Public Policy and Advocacy for the Iowa Medical Society; and is the President of the Friends of the Iowa Commission on the Status of Women. Karla also provides consulting services to clients leading them through positive outcomes for legislative proposals before the Iowa General Assembly. Karla’s description of her career was also a consolidated version of her three-minute professional elevator speech; which she then directed the group to rehearse themselves at the tables in small groups. Following the professional elevator speech, Karla requested everyone to present their 3-minute personal elevator speech. The room buzzed with discussion. Karla then asked, “Which was easier to give? The personal or professional speech?” To Karla’s surprise, most responded that the personal speech was easier and Karla reiterated the importance of frequently practicing a professional elevator speech. Karla continued by giving her personal speech. She has an amazing husband who she loves dearly; a fantastic son and many great friends who she travels with. She noted that it’s hard to take your professional story out of your personal story, and the same goes for the reverse. Recognizing the work done by iaWia in their Best Practice Recommendations (BPR) document completed in 2013, Karla led the group in discussing known outcomes of implementation of the BPR. She asked, “Are there examples anyone can give of specific changes made in their firms due to the survey implemented from the BPR?” Anna Jones with Substance Architecture noted that the iaWia survey triggered a revision of their policies and procedures, of their annual review process, and brought the firm together for a retreat to discuss the issues brought up by the survey and BPR. And recognize all sides of the story – men, women, entry-level to senior-level. After discussing the active ways the group can push implementation of the BPR into the various workplaces, Karla moved to focus on the individual. She urged that mindfulness, awareness of surroundings to reduce stress, and being present with yourself are integral to finding focus and reducing anxiety. “Spend 30 minutes every day just thinking about yourself,” she said, “how else are you going to keep yourself sane?” Karla continued explaining that curiosity is important and stillness aids mindfulness which allows you to truly think about yourself. She continued to discuss that emotional intelligence is an incredible skill which allows you to sense anger, stress, and emotion amongst your team and use this to decide how to best respond. She noted that women tend to have more emotional intuition naturally than men; use this as a tool. Karla explained the toxicity of overthinking which ties up with feelings of worthiness and perfection. Finding yourself and using mindfulness to balance these thoughts is crucial to sustainable success. Moving beyond yourself, Karla also recommended that you need at least one go-to person. Someone you can talk to, who thinks like you and who you can trust. Along with this, she explained, you must have fun! Humor is important every day. Find your kind of spirituality, she said. Whether that is religion, community, social compassion, or volunteering. Karla suggests that mentoring is an excellent way to give back and is a practice of trust, giving support, and celebrating success. Karla wrapped up the session discussing vulnerability. Believe it or not, she explained, her vulnerability is public speaking. Ridiculed by a speech teacher in high school, Karla has spent her life working on being confident through her speaking, mentoring, and coaching. Thank you to KJWW for sponsoring cookies and water for this event!